We have a new entrant into the UK Electric Car market. Yes – Kia has launched its first 100% electric vehicle, the Kia Soul EV. With a starting price of £24,995 (after the government’s £5,000 Plug-in Car Grant), Kia claim the Soul EV can deliver 132 miles from a single charge. Slightly more than Nissan claim for the best selling Leaf. You can recharge the battery from a standard domestic plug socket, using the Kia-branded wallbox supplied as standard with the vehicle, or at a public fast charger. Using a UK 230-volt domestic power supply, the manufacturer says the Soul EV can be fully recharged in 10 to 13 hours. Perfect for urban driving, the Soul EV has a top speed of 90mph and can accelerate from 0-60mph in 10.8 seconds. Visually, it’s identical to the fuel-powered model apart from the lack of a front end radiator grille and a fuel filler flap. The power is from a lithium-ion polymer Battery pack with a 27 KWh Capacity. Powered is delivered via an Interior Permanent Magnet Synchronous Motor (IPMSM) – 3 Phase AC 81.4kW.Synchron Motor. The model is available in a choice of two colour schemes: Caribbean Blue metallic with a Clear White roof, or Titanium Silver metallic. The interior upholstery for both options is Grey Eco cloth with blue stitching, while the fascia panel, door inserts and gear selector are finished in High-gloss White. The instrument cluster housing, door inserts, steering wheel and gearshifter are trimmed in leather. Standard features include: an eight-inch touch-screen with European mapping traffic messaging channel, reversing camera and charging point locator heated front seats a smart key with a motor start-stop button and projection headlights with LED daytime running lamps. The car is supplied with the wallbox charger and Virtual Engine Sound. 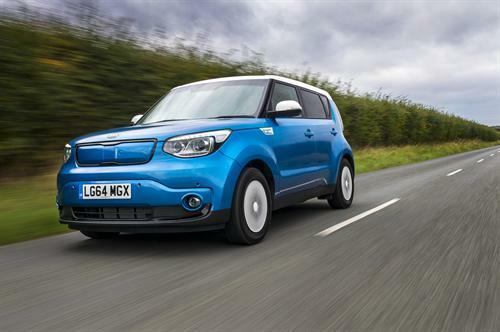 As with every Kia, the Soul EV is covered by Kia’s seven-year/100,000-mile warranty, which includes all labour and parts except those subject to normal wear and tear. The warranty is transferable if the car is sold before the time/mileage limit expires. Our test vehicle request is with Kia so we can bring you a full report in due course.